The International Space Station has pretty much everything you could possibly need while in low Earth orbit. Including its solar panels, it is roughly the size of a (U.S.) football field. Inside, it has as much pressurized space as a Boeing 747 jet. 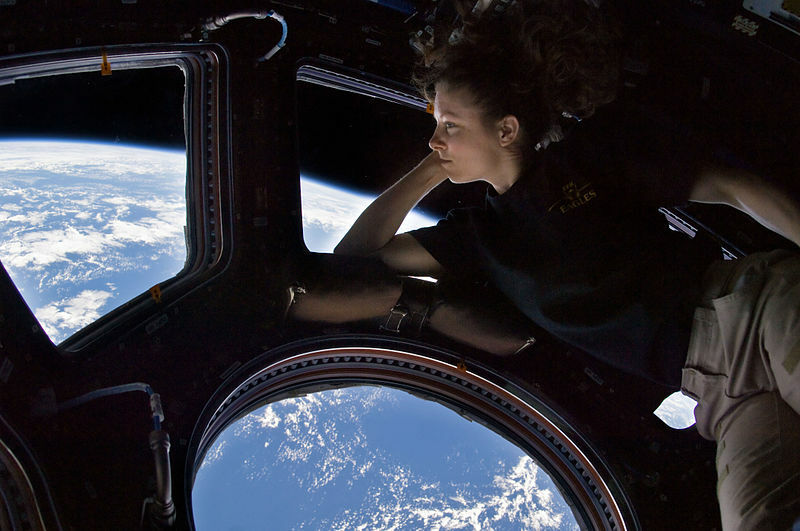 ISS residents have access to two bathrooms, a gym, and, in case they're feeling homesick, a giant window for Earth-gazing. 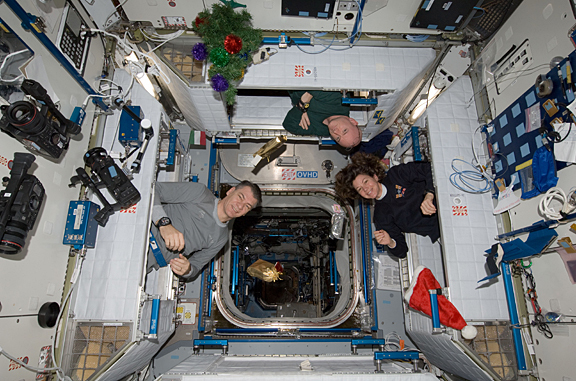 Astronaut Tracy Dyson, floating in front of the cupola. The menu for the six astronauts living aboard the ISS is varied and tasty: brownies, sushi, fajitas, and cherry-blueberry cobbler. You have high-speed internet access, your own little bedroom, and once in a while, an ice cream social. Half of the ISS Expedition 26 crew, peeking out of their "rooms" on Christmas morning. 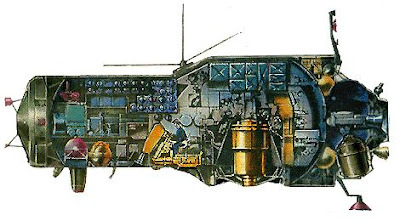 But... a 1970s Soviet military space station, the Salyut 3, has got the ISS beat in one strange way. What does Salyut 3 have that the ISS is missing? A 23 millimeter automatic cannon, mounted to the long axis of the station. Reports on the cannon, and whether it was ever fired, are a bit sketchy. 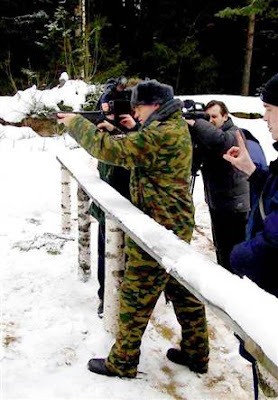 Some sources identify the gun not as a Nudelmann 23 millimeter auto-cannon, but a Nudelmann NR-30 30 millimeter cannon. Despite the gun's existence being declassified after the Cold War ended, it seems that most of the information the world has on Earth's first true space weapon is hearsay and rumor. However, the reason for the gun is clear. Salyut 3 was a military space station, meant to be crewed by air force officers and tasked with spying. The station orbited at a low altitude to aid in photographing Earth's surface (about 50 miles below there the ISS usually sits). According to Russian sources, the auto-cannon was installed "for defense against U.S. space-based inspectors/interceptors." It is thought that the dish antenna at the bottom right is for transmitting encrypted data (i.e., spy photographs). The gun could only be pointed at a target by moving the entire space station to face the target. A periscope peering out of the station served as the gun's sight. Its construction took into account Newton's Third Law of Motion (for every action there is an equal and opposite reaction). The station was equipped with special maneuvering engines that would automatically counteract the thrust of the gun firing with engine thrust. Just as the cannon's operation didn't violate the laws of physics, its existence didn't violate international law either. At the time that Salyut 3 was launched, the Soviet Union had signed and ratified the 1967 U.N. treaty governing weapons in space, the Outer Space Treaty. But this Treaty only bans "weapons of mass destruction" in space. It seems unlikely that a 23 millimeter automatic weapon would qualify. 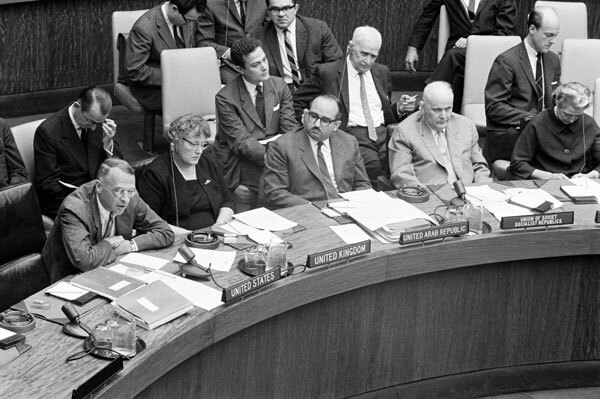 Negotiating the Outer Space Treaty. Was Salyut 3's gun ever fired in space? Probably- though fortunately it was never aimed at any American astronauts. The commander of the only crew to actually use Salyut 3, Pavel Popovich, claims the gun was never fired while cosmonauts were on board. But, it is believed that the gun was tested at the end of Salyut 3's lifespan, while the space station was empty but before it was de-orbited. The only crew of Salyut 3: Pilot Yuri Artyukhin and Commander Pavel Popovich. There's one other odd fact I want to share on the subject of armed space stations. While we can all be grateful that the ISS doesn't have a large automatic weapon mounted outside, there are in fact usually two pistols aboard the ISS. Each of the ISS's two Soyuz escape pods is equipped with a pistol. Neither NASA nor the Russian Space Agency provide many details on it, but cosmonauts have said that they are the typical sidearms carried by members of the Russian military. Unlike the Salyut 3 auto-cannon, these pistols are not meant to protect against armed space invaders. Their stated purpose is to protect astronauts and cosmonauts from danger they might encounter on landing. Space tourist Mark Shuttleworth training to shoot the Soyuz's gun. Which may sound far-fetched... but history records the dangers not just of space travel, but also the dangers one may face after landing. Back in 1965 the crew of the Voskhod 2 landed 200 miles off course, deep in the Ural Mountains. They reported hearing wolves prowling around their space capsule as they waited overnight for rescue. 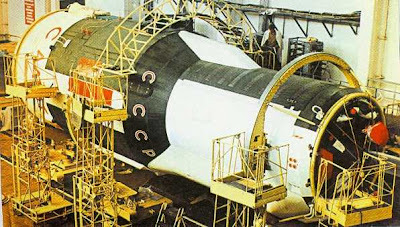 Voskhod 2 also featured the first ever space walk! 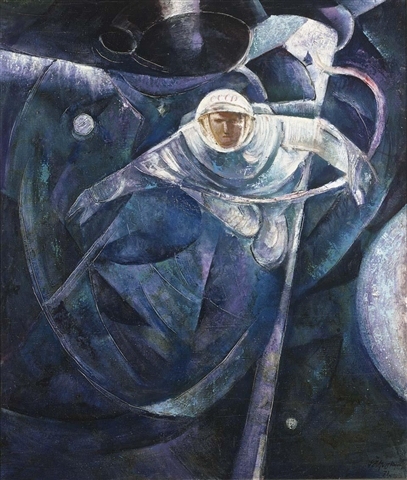 Here's Pilot Alexy Leonov's own painting depicting his walk in space. That's not the only time cosmonauts have encountered danger after landing their spacecraft. Check this out this story too! Source: Fourmilab.ch; spaceyard.blogspot.com; astronautix; langston.com; svengrahn.pp.se; MSNBC; Wikipedia. Thanks so much! :-) Your blog is very interesting too!